Every year YouTube Rewind does their year in a review through a video recap of their year´s most viral videos, events, memes and music. 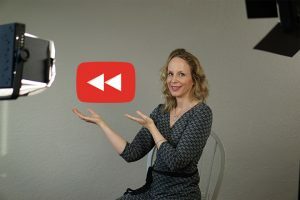 This year I thought I would do a YouTube Rewind of my own channels for 2017, going back over the top 10 videos of 2017 on both Yoga with Dr. Melissa West and Yoga Lifestyle with Dr. Melissa West exploring the most viewed videos of this year on both channels. Hi I’m Melissa from Yoga with Dr. Melissa West, we´re all about We are all about connection, connection to a teacher and teachings that allow you to connect with your True Nature and a community of people that are dedicated to a genuine path of spiritual transformation. What was your favourite yoga class on my channel this year? I thought it would be fun to do a little YouTube Rewind on my own channel as we come to the end of this year. Here are most viewed videos on my Yoga with Dr. Melissa West YouTube Channel in 2017. BTW, thank you to the nearly 6K new subscribers this year! I appreciate each and everyone of you who have subscribed to my channel. This was the first restorative yoga video I made for my YouTube channel, 6 years ago back in 2011. Filmed back when we lived in Toronto. This marks to a big turning point in my Yoga with Melissa YouTube channel this year. We decided to really niche down and focus on what we were about. We realized that we are quite different from other channels and instead of fighting that so much we decided to embrace that and make our channel a place where people could come to restore their energy. This led to releasing almost 10 new restorative yoga classes on our channel this year, including restorative yoga collaborations. Mai Meret and I did our Phoenix Rising Yoga Therapy Level 1 and 2 training together. She filmed this for me 7 years ago in 2010. It continues year after year to be one of the most viewed videos on my channel. If you are a yoga teacher and you love kids, niche down to kids. If you are a yoga teacher and you love kids and you want to start a youtube channel – make it a kids yoga channel. That is my advice to you. This was filmed in April of 2014 just before we moved West to Victoria BC. It was one of those one off classes where I was just having fun. I think everybody picked up on that fun. It wasn´t even really a class, in that I just show you move after move where you can use a strap. It continues to be a most watched video. This one is another anomaly, part of a series filmed before we left for the West coast in February of 2014. The whole series did ok, but this one, for some reason people seek it out. My beginner classes continue to be my calling card. Yoga with Melissa 101 was my first beginner class back in October of 2011, 6 years ago. It is Tim´s favourite class and the only one he will practice. We now have almost 50 beginner yoga videos, a 31 day challenge and 5 brand new beginner yin yoga videos (we will talk more about yin yoga in a bit). Collaborations were a big deal this year on Yoga with Dr. Melissa West. Sherry was the fifth person I collaborated with this year and her Chair yoga class has been a huge hit on my channel. I really appreciate Sherry and her class taking the time to make this video for my channel. This video was part of the moving at the speed of our bodies series, which I had such high hopes for, but ultimately I think the series fell kind of flat, outside of this video. For some reason, this video resonated with people. There are important teachings in this video and this series so I am happy to see it is on the top 10 most viewed videos of the year. This video focuses on tree pose, deals with our culture of distraction and anxiety and helps us find stillness. A few months after I made my first beginner yoga class I made my second beginner yoga class, on finding time. Back then, 6 years ago, the number one complaint I got from people was that they could not find time for their yoga practice. I do not hear this complaint nearly as much anymore. People seem to understand the need for a spiritual practice, yoga and self care now, that it isn´t a luxury but a necessity. This was the class that I believed changed everything this year. It has been the most watched video on my channel month after month this year. Kassandra was one of the first people to collaborate with me and for that I will be forever grateful. She has gone on to have tremendous success on her channel and so I am sure that is why this video gets sought out. However, that being said, what we noticed was that people started searching for yin yoga on my channel and started searching for yin yoga with my name. I had been practicing yin yoga consistently with a teacher here in Victoria BC for the past almost four years. Several times I had considered doing yin yoga teacher training but pushed the idea aside because yin yoga teacher training is so expensive. Anyway, eventually we could not ignore the number of people that were searching for yin yoga melissa west and I went for the training. This year I have managed to release 5 beginner yin yoga classes and I have even started to release some intermediate yin yoga classes. We now have 9 yin yoga videos on my channel and that library will continue to grow. The number one most watched video this past year is another beginner class. This was in May of 2012 about a year after my other beginner classes were gaining a lot of traction and I decided to take making beginner classes quite seriously and turn them into series. This is the beginning of a series of beginner classes and talks about how to prepare your body – or all the poses that prepare your body for a yoga class. I loved this series and so did a lot of you. So what was your favourite yoga class this year? What was your favourite yoga style this year? Beginner, Yin, Restorative? What do you want to see most in 2018? As we move into my Yoga Lifestyle channel we switch gears to answering your questions and solving the biggest problems that you have. BTW thank you to the 3K new subscribers on this channel this year. I appreciate each and everyone of you who has subscribed to this Yoga Lifestyle channel. Here are most viewed videos on my Yoga Lifestyle with Dr. Melissa West YouTube Channel in 2017. After taking meditation classes for a year I feel I need to make more videos like this. Mostly what needs to happen is people need to be given more permission to meet their bodies where they are at. For some reason people feel that meditation means sitting cross legged on the floor. I have seen elderly people come into my meditation class and do everything they can to get themselves onto the floor when they should be sitting in a chair. Sometimes I wonder if they are even going to be able to get up. So I guess addressing the kind of violence behind forcing our bodies to do things that they are not ready to do is probably the most important thing. This video I was so excited to make, because I have another video on tinnitus and I can only imagine how difficult it must be to have ringing in your ears. This was a mudra I found in mudras of India that I shared as soon as I found it because I knew that one of my close students has tinnitus. This was a video that I also made with a particular student in mind. I had done specific training around pre and post natal exercise when I was pregnant and just after I had Trinity. So I enjoy going back to that from time to time although it is not really a focus for me anymore as I am now more in my peri-menopause years rather than prenatal and postnatal years. This one also comes from my knowledge from pre and postnatal training. It comes in handy and if you are a woman, this information is useful! This video I made when I lived in Toronto and I planted lemon balm. If any of you have ever planted it you know how abundant it is. Lemon balm is also known as Melissa Officinalis my name sake, so it is a special herb to me. Also it is an amazing herb for stress, anxiety and insomnia so it is a great herb for our channel. This was my second being on your feet all day video, made in response to the wild success of my first being on your feet all day video. If you stand a lot you know it can be painful for your feet, legs and low back. Expect to see more of these videos from me in 2018. I also think I will do some videos for people who sit all day, because sitting presents its own pains. I used to have two features smoothie Saturdays and Thirsty Thursdays where I did juicing videos. I know many of you would like to see these come back and wonder why they have not come back. Well, the most I have learned about nutrition, ayurvedic medicine and traditional chinese medicine, I just could not continue to make videos like this. Juicing and Smoothies in from my educated opinion are not healthy for you. Juices usually have way too much sugar and lead to weight gain and headaches. Smoothies are often the same. Also smoothies are cold and just quell the digestive fires. I do not partake in either of these anymore. I think you get way more benefit from teas, tinctures, and soups and so that is why you see me promoting these things on my channel, even though they are not nearly as popular or widely accepted. This was the first video I made for people who stand all day. I made it 4 years ago back in 2013 in response to somebody´s question. Seems like it is a good idea to answer your questions no matter how obscure they seem to me! So again this is back when I was doing juicing videos. Eye health! Who knew! Maybe I will do some eye health tips or eye yoga in 2018 and see how those fair. Finally constipation relief. This topic and video continues to do really well on my channel and no wonder. If you have constipation it is so uncomfortable. I did used to experience constipation before I practiced yoga and yoga is wonderful for relieving constipation. That said, I do think that I will need to start speaking to lifestyle choices as well. No amount of apanasana or twists is going to help if you are not eating lots of veggies and drinking lots of water and herbal teas. Which topic is most helpful for you? What vlog was your favourite this year?